In most cases, preventive dentistry is covered 80 to 100% by dental insurance benefits. This means you’ll have little to no out of pocket cost. Preventive dental care also dramatically reduces your risk for more advanced oral health concerns that receive less coverage from insurance providers. When you keep up with twice a year dental office appointments and thorough at-home hygiene, your smiles stays healthy and your out of pocket costs for dental care are minimized. Know your maximums. Most dental benefit plans have annual coverage maximums between $1,000 and $1,500. They also set maximums on coverage for specific services. Communicate and plan ahead in partnership with your dental office. If you know you’ll need an advanced dental treatment, your dentist may be able to help you plan to split the cost of treatment across two insurance plan years to help you maximize your benefits. Ask for preapproval before beginning advanced dental treatments. This ensures your benefits will be available when you need them. At Geller Dentistry, our knowledgeable team members are always happy to answer your dental insurance questions. 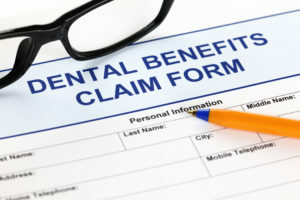 We have years of experience processing and filing dental benefit claims to make the most of your available coverage and help you plan to maximize benefits each year. If you have questions about dental insurance coverage or you need to schedule your second dental exam of the year, don’t hesitate to give our friendly team a call to set a time to visit us in our Larchmont Village dental office. From basic dental checkups and teeth cleanings to more advanced preventive and restorative dentistry services, the Geller Dentistry team is here to keep you and your family smiling.